The Better Way. Every Day. You encounter us every day on the roads of our planet. Our products, systems, services and turnkey solutions make travel safe and convenient for people on the move. In the spirit of SWARCO founder Manfred Swarovski we pride ourselves in being agile, innovative, reliable and trustworthy; and will not hesitate to go the extra mile for you. The traffic technology group SWARCO – headquartered in Wattens near Innsbruck, Austria – has an international network of production facilities, offices, and partners across the globe. Together, we offer one of the most complete solution portfolios for road marking, signage, urban traffic management, parking, highway and tunnel management, public transport, and street lighting. We connect vehicles with the road infrastructure, help in setting up charging infrastructure to boost electro-mobility, and offer modular and holistic solutions that support tomorrow’s mobility and make our communities more livable. to craft a solution to meet your individual requirements. 2019 – a Special Year for us. Man made his first steps on the moon in July 1969. A little bit earlier, in May 1969, young Manfred Swarovski made his first steps as an entrepreneur by founding his first glass bead factory in Austria, laying the foundations of what we call SWARCO today. 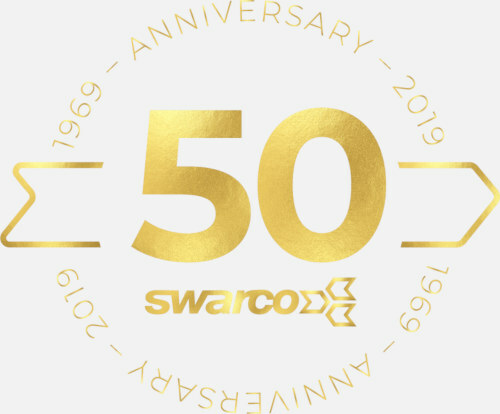 Since then a lot has happened in the SWARCO universe, which makes us very proud of celebrating our 50th anniversary this year. A story like the one of SWARCO has only been possible because passionate people, family spirit, entrepreneurial thinking, risk taking, financial resources, innovative products and solutions, perseverance, reliability, and a large number of loyal customers have come together for a common goal: make travelling on the roads of our planet safer, more convenient and environmentally sound every day. In 2019, the SWARCO Group presents itself stronger than ever before. The entire SWARCO family has every reason to celebrate its 5-decade success story. We Offer Multi-Modal Transportation Management for a Connected World. Cities are commonly referred to as the engines of economic growth. Hence there is an urgent need for cities to find smarter ways to handle large-scale urbanization and find new ways to adapt to new situations, manage complexity, increase efficiency, reduce their ecological footprint, engage citizens, reduce expenses, and improve quality of life for everybody. The smart city becomes an extended and heterogeneous mix of systems and services, where mobility represents a supporting pillar. 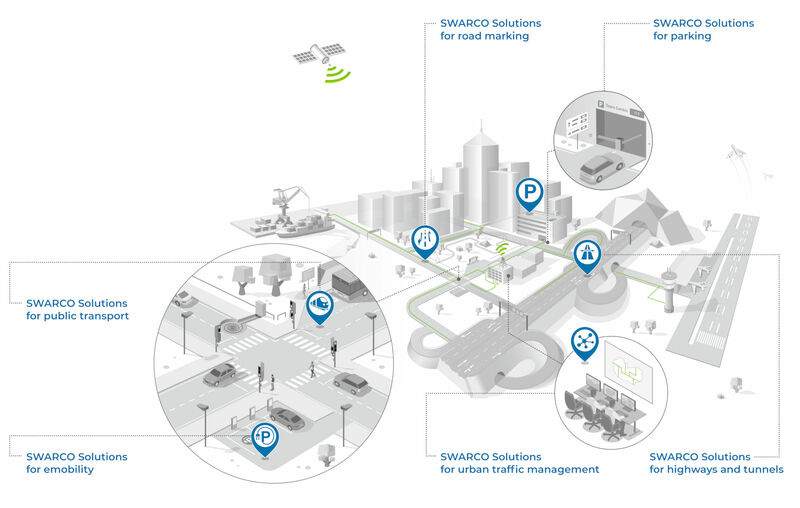 SWARCO is supporting smart city growth by guiding the development of its products and solutions towards a new mobility management concept. Mobility management acquires a broader meaning and uses the latest technologies to intelligently combine individual driver objectives (individual user optimization) together with network-wide management strategies (system optimization and equilibrium) in a win-win scenario. The future of traffic management is to build upon the deployment of connected vehicles and travellers in order to achieve convergence of mobility services and traffic, while giving value to the legacy and creating new business opportunities. Multimodality is key to the smart city vision and is supported by the rising priority that cities are giving to cyclists and pedestrians. SWARCO works daily to facilitate the creation of smart ecosystems, by connecting the worldwide community and creating productive relationships with professional and academic organizations working in linked market segments. Intelligent roads for romanian cities.